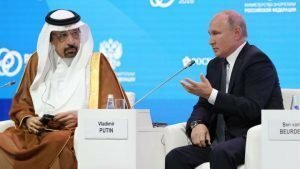 If there was any question concerning Russia’s burgeoning engagement with Saudi Arabia after the much-discussed “high-five” at the G-20 summit, Russian President Vladimir Putin has set the record straight. In a sign of support for the PR-embattled Saudi crown prince, Russia warned the U.S. against efforts to influence royal succession in Saudi Arabia and offered its support for the kingdom in the wake of the murder of dissident journalist Jamal Khashoggi. With Moscow’s distancing from the West due to continued tensions with Europe and the United States and Putin’s ongoing military support for the Assad regime, Russian policy towards Saudi Arabia shows the revival of Cold War era geopolitics. In recognition of its regional partnerships, however, Russia favors the convergence of strategic interests rather than ideological concerns. After four years of souring relations with the West, in part resulting from the alleged interference in foreign domestic politics and targeted assassination attempts, Moscow has increasingly strengthened diplomatic and trade ties with China in the east and, at the same time, has garnered influence with Middle Eastern countries such as Saudi Arabia. Despite fundamental divergences with Saudi Arabia over developments in Syria and its ongoing engagement with Shi’a Iran, the manifestation of a mutual foreign policy pragmatism has enabled Russia to downplay ideological differences while highlighting the benefits of engagement. The benefits of foreign policy pragmatism can be seen within the realm of economic engagement in particular. 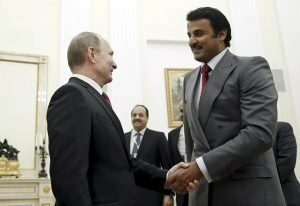 Over the last few years, the Russian Direct Investment Fund (RDIF) concluded several agreements worth tens of billions of dollars with GCC sovereign wealth funds, which aim to increase long-term investment in Russia’s infrastructure and energy sectors and reduce the effects of the financial sanctions leveraged on Russia by western markets. Saudi Aramco, the kingdom’s state-owned oil company, has also been eyeing cooperation projects in Russia. In October, reports indicated that Aramco was in discussions to buy a 30 percent stake in Russia’s upcoming $25.5bn Arctic LNG 2, which would allow Novatek, Russia’s largest private gas company, to secure funding for its natural gas project in northern Siberia. For Saudi Arabia, in return, Russia is considered a lucrative market for investors due to its potential for high yields. In a recent economic forecast, consulting firm Deloitte found that higher oil and commodity prices and an ease in monetary policies, which enabled a return to growth in 2017, continue to boost economic activity. Bilateral economic cooperation also provides Saudi Arabia with a means to counteract tensions with Washington through an alternate geopolitical alignment. In the wake of the Iran deal forged under former U.S. President Barack Obama, Saudi Arabia ended years of animosity with Russia by cooperating on the regulation of global crude supplies to prop up the market. Moscow also appears to be reaping the benefits of the latest Saudi-U.S. dissension. In the wake of the Khashoggi murder, members of the U.S. Congress have condemned the Saudi crown prince. In an effort to ratchet up pressure on U.S. President Trump, the Senate overwhelmingly voted to end military support for the Saudi-led war in Yemen last month. Much to Washington’s dismay, Riyadh is responding to the prospect of sanctions by threatening the cancel the Trump-touted multi-million dollar arms deal in favor of Russia’s S-400 air defense system. In part, Moscow’s compartmentalization of its relations in the Middle East has benefited from rivals’ reliance on Russian courting. Putin banks on fears that a lack of coordination with Moscow will result in Russia aiding a respective rival even more – thus giving each party an incentive to continue or even increase its cooperation with Russia. This balancing act can also be seen in Moscow’s engagement with Qatar, which has been the subject of a Saudi-led embargo since the summer of 2017. Qatar Investment Authority’s (QIA) assets in Russia were valued at more than $2.5 billion in 2017. Last November, QIA invested more than $4 billion in Russian oil giant Rosneft, becoming its third-largest stakeholder. Moscow’s intended sale of an advanced aerial defense system to Qatar despite Saudi opposition further indicates that, at present, Moscow can have its cake and eat it too. For now, Russia appears to be able to balance existing regional rivalries without endangering its bi- and multilateral engagement with Iran and Syria, on the one hand, and the Sunni kingdom, on the other hand. With President Trump’s announcement of a military withdrawal from Syria and the impending threat of proxy confrontations between regional foes, however, future cooperation between Moscow and Riyadh stands to become ever more complicated. Grace Wermenbol specializes in the contemporary geopolitics of the MENA region. She holds a Ph.D. and MA from Oxford University (UK), where she also held teaching and research positions. 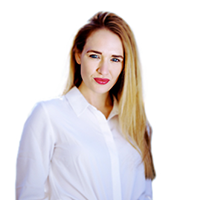 Dr. Wermenbol regularly contributes to international media outlets and think tanks, and she is currently in the process of writing an academic monograph with Cambridge University Press. She currently serves as a Non-Resident Scholar at the Middle East Institute in Washington DC. Adam Taylor, “Russia says Putin greeted other leaders just like the Saudi crown prince. Let’s check the tape.” The Washington Post. December 3, 2018. Richard Hall, “Jamal Khashoggi: Russia refuses to criticise Saudi Arabia in wake of journalist’s murder”. Independent. October 23, 2018. Ellen Barry and Richard Pérez-Peña, “Britain Blames Moscow for Poisoning of Former Russian Spy”. The New York Times. March 12, 2018. “Russia, Saudi Arabia Agree To Expand Cooperation On Oil, Gas”. RFERL. June 15, 2018. Henry Foy “Russia-Saudi Arabia rapprochement reshapes more than the oil market”. Financial Times. October 29, 2018. Clare Foran, Ted Barrett and Manu Raju, “Senate rebukes Trump, condemns Saudi crown prince for Khashoggi murder”. CNN. December 13, 2018.